A while back, I reviewed Motivate Your Child, an amazing book by Dr. Scott Turansky and Joanne Miller. 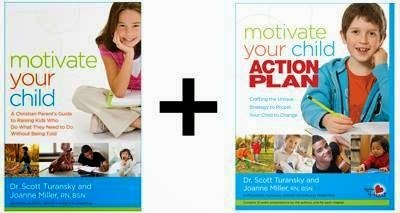 I am thrilled to be a part of the launch team for their latest book, Motivate Your Child Action Plan! The Action Plan stands alone as a great tool for parents, and of course, goes perfectly with what they share in Motivate Your Child. The books published by the National Center for Biblical Parenting, including the Motivate Your Child Action Plan, advocate heart parenting. 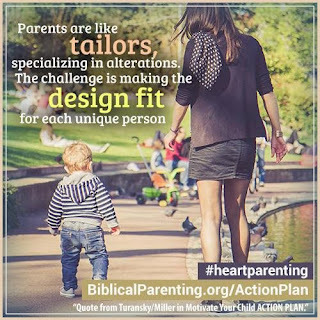 Parents are encouraged to address the heart of a child, rather than only their behavior, and to be proactive in helping them become the person God created them to be. This approach is necessarily unique to each child, because each child is so different. Motivate Your Child Action Plan is designed to help parents find the steps to help their child work through things they need to change. This book is set up like a workbook, and helps you figure out exactly what you need to do to address an issue with a child. There isn't a lot of writing - there are places for you to write, if you'd like. I have more than one child and more than one issue to address, so I do any writing in a separate notebook. In fact, writing things down has been key for me, because I tend to forget easily what has been discussed, and if we are going to have a plan and I am going to be consistent with helping them work through the plan, I'm going to need a written record of it. I'd never thought about writing things like this down before, and it's been very helpful. There are twelve chapters in the book, and they average approximately 10 pages each. Additionally, there are 12 audio recordings, one to accompany each chapter - the download instructions are in the book. You will learn how to identify specific areas in your child's character that need to be addressed, and work with them to strategize ways they can make changes. I love that the focus is on having the parent and child work as a team. We're also encouraged to pray for and with our children, and meet with them throughout the process. It's so important to maintain that connection. Also, parents are encouraged to review how things are going as they work with their children, and make any adjustments to what they're doing as needed. Don't confuse firmness with harshness. Firmness draws a line that says, "This is not optional." Harshness adds emotional intensity to show that you mean business. Harshness damages the relationship and isn't necessary. (64; ch. 5). That one section speaks directly to my heart. I have a hard time keeping harshness out of my tone. It's something I've worked hard on over the years, and the only way I made any progress was to turn it over to the Lord and let the Holy Spirit work in my heart. I see the same thing now in one of my children. We are talking about it, working on it together. In fact, I showed them that quote, and pointed out that they tend toward harshness, particularly in dealing with another sibling. They are learning to turn to God, too, and listen to the prompting of the Holy Spirit. As wonderful as my children are, I can see in each of them issues we need to address. I haven't been sure how to go about that. I am pretty good at seeing the big picture: I can generally see what needs to change. I'm often stymied, though, when it comes to figuring out exactly how to accomplish those changes. As they say, the devil is in the details, and I am not always good with the details. That's where this book comes in: it helps me think through each part of the process, and remember that change isn't going to happen overnight. I'm learning more about how to be the mother my children need. Thank you, Dr. Turansky and Mrs. Miller, for sharing your work. 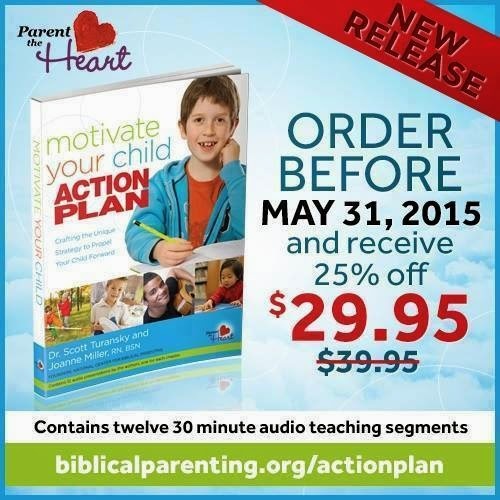 If you order the Motivate Your Child Action Plan book through the National Center for Biblical Parenting before May 31, 2015, you can get it for $29.95 - 25% off the regular price of the book. If you don't have the Motivate Your Child book, yet, and you'd like to get it along with the MYC Action Plan, you can order them together for $36.99 and save 35%! You can also purchase the ebook version of MYC Action Plan for $9.99 for Kindle, Nook and iBooks. 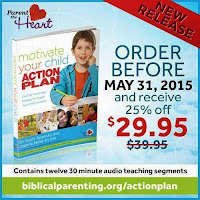 Motivate Your Child Action Plan GIVEAWAY!